Pre cut tape sheets in a pad format provide convenient and easy repair of damaged packages in industrial and commercial applications. Ideal for protecting labels, sealing envelopes, small packages, recouperage repair and other packaging applications in foodbeverage, general industrial, retail and consumer goods industries. Strong rubber adhesive on the polypropylene film offers excellent adhesion to many surfaces. Pads are convenient and portable, requiring no dispenser for easy use. Padded format allows blade free operations so you won't have to use a knife to cut to the right size. 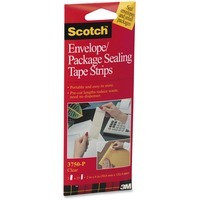 Use tape for protecting, sealing, packaging, holding, closing, labeling, repairing, recouping, attaching and securing.